What happens when the one that got away comes back? Find out in this sparkling comedy from #1 bestseller, Mhairi McFarlane. 'Think of the great duos of history. We're just like them.' 'You mean like Kylie and Jason? Torvill and Dean? Sonny and Cher?' 'I think you've missed the point, Rachel.' Rachel and Ben. Ben and Rachel. It was them against the world. Until it all fell apart. It's been a decade since they last spoke, but when Rachel bumps into Ben one rainy day, the years melt away. They'd been partners in crime and the best of friends. But life has moved on: Ben is married. Rachel is not. Yet in that split second, Rachel feels the old friendship return. And along with it, the broken heart she's never been able to mend. 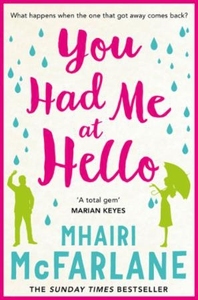 Hilarious, heartbreaking and everything in between, you'll be hooked from their first 'hello'.